Update: These coupon codes are no longer working. Here is a fun deal if you like Neutrogena personal care products! Make any purchase on Neutrogena.com and get a free Rain Bath 16 oz Gel for FREE with coupon code RB2013. Make it even more fun by getting an additional 15% off and FREE Shipping with coupon code HAPPY123. The least expensive product I could find is the T/Gel Therapeutic Shampoo 4.4 oz for $3.99 meaning you get both for $3.39 after the coupon codes! 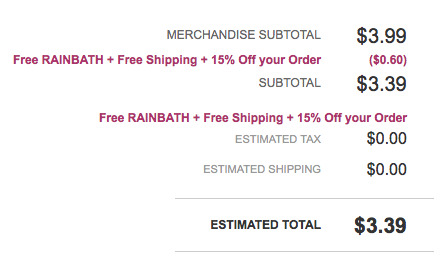 The Rain Bath is normally $10.99 on it’s own, so this is pretty fun.